Here’s the story of the Anglo-Saxon goddess who’s responsible for putting chicken eggs in a bunny’s basket and who has magic powers similar to the magic of Spring itself. This year, Easter and Spring are separated on the calendar by 29 days, almost as many as possible. Spring arrives March 20 and Easter is April 21. 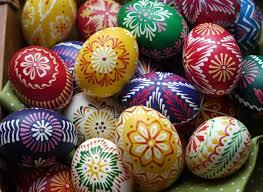 The earliest possible date for Easter is March 22 and the latest possible is April 25. There are 35 dates on which Easter can take place. The reason is that both depend on the sun and the moon and the various phases of each. The vernal equinox is determined by when the sun crosses the plane of the earth’s equator, making night and day of approximately equal length all over the earth and occurring about March 20 or 21 in the northern hemisphere and about September 21 in the southern hemisphere. Easter, on the other hand, moves according to the moon and occurs on the first Sunday, after the first full moon, after the vernal equinox. Easter is on Sunday because according to the Biblical story about Jesus, it was on the first day of the week when he emerged from his tomb, the day which Christians know as the resurrection. This is also related to Passover (Seder) in the Jewish tradition and it is believed “The Last Supper” is what Jesus celebrated with his disciples on that Thursday evening before he was crucified on Friday. Then, three days in the tomb before a new life, just like what seems to happen in the Spring, new growth, a new season, another beginning. The date for Passover begins on the 15th day of the month of Nisan, which typically falls in March or April of the Gregorian calendar. Passover is a spring festival, so the 15th day of Nisan typically begins on the night of a full moon after the northern vernal equinox. You can see how Passover and Easter may come close together if you do the calendar calculations. So, Easter and Spring, at least in the northern half of the world, became so connected that one was easily merged into the other and the close association has remained ever since. Whether you celebrate with meals, with family traditions, with bunnies and eggs, or with a renewal of your faith, take some time to enjoy the experience of this holiday (holy day) and make of it what you will. Celebrate Spring with gratitude for what we receive from the sun, the moon and earth’s bountiful blessings. And, if you want to count EOSTRE as partially responsible for these happy times, she’s glad to have you among the flowers, the eggs and the bunnies. Fascinating. I know that the date changes every year… the way I always say it is it’s sometimes early, sometimes late. Thanks for sharing this! Thanks! I have fun every Spring dancing around observing and measuring the sun movement. Here’s the real explanation: The Moon orbits around the Earth. The Earth orbits around the Sun. The Sun orbits around Sagittarius A*, the black hole at the center of our galaxy. 1 orbit of the Sun around Sagittarius A* is called a galactic year. It is equal to 237.5 million terrestrial years on average, and the Solar System is traveling at an average speed of 828,000 km/h (230 km/s) or 514,000 mph (143 mi/s) within its trajectory around the galactic center, a speed at which an object could circumnavigate the Earth’s equator in 2 minutes and 54 seconds; that speed corresponds to approximately 1/1300 of the speed of light. Now take that in and breathe deeply. I am off for a walk as soon as there’s enough light.